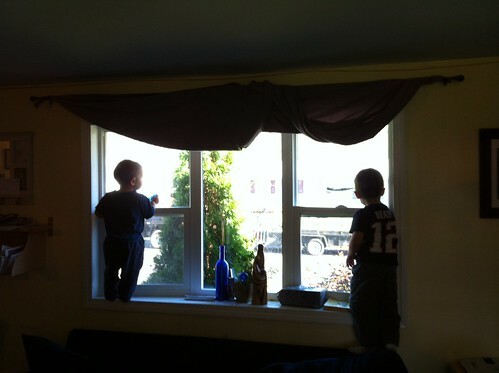 Ben and Anthony at the window, watching the guys doing yard work across the street. Forgive me, my memory is a sieve right now. I know I mentioned in the comments of a previous post that I was planning to write a longish post about First Grade and what I planned to do and how it’s actually panning out several months into the school year. I no longer remember which post it was nor who was inquiring about the topic. But at least I didn’t forget that I was going to write the post! Several people have asked me at various times about homeschooling first grade, curriculum choices, how it’s going, etc. So I’ll post the plan and amend it (in bold) with my notes about how we’ve been meeting those goals and how we’ve fallen short. I think this is a good point to pause a bit and re-evaluate and maybe think about what tweaks I’d like to make. First, a note: my two primary goals for Bella’s first grade year were making progress with math and reading. Everything else was a distant second. Some may object that perhaps faith formation should be up there as a primary goal. And I agree—sort of. But I think of faith primarily as an encounter with a person and not a school lesson. Therefore the proper framework for developing that relationship is domestic church and not the school room. True, the two spaces overlap, are literally mapped one on top of the other; but I do separate them in my mind. 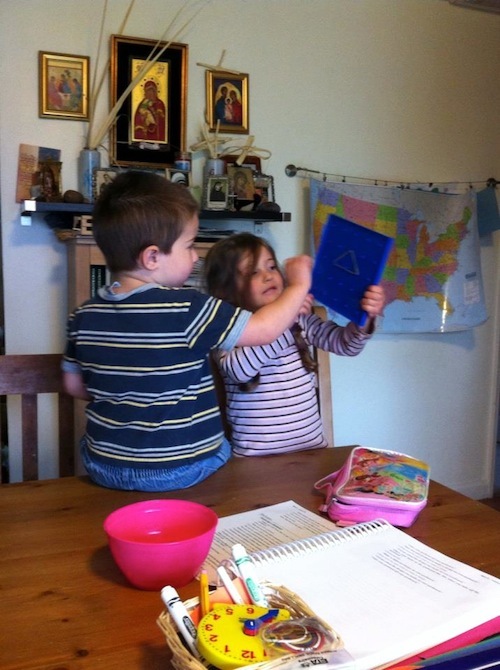 My catechesis plans—the “school work” part of religious formation—are modest: I’d like to work on memorization of some prayers, learning the catechism, basically preparing her for making her first penance and first communion. We read Bible stories and lives of the saints. Most of faith formation, though, is not what we do but how we live. Thus I try to weave daily prayer into the fabric of our lives: I begin the day listening to the liturgy of the hours podcast in the kitchen as I make breakfast; I pause to pray the Angelus when my phone rings at noon and six; we pray grace before meals; we gather at the end of the day as a family for bedtime prayers. We go to Mass on Sundays and holy days. We try to go to Adoration with other homeschoolers, to the inaugural Mass for homeschoolers with Cardinal Sean, and to build relationships with various priests and religious. Mainly what we do is establish habits of living the faith as a regular part of our family. We plan to utilize many resources in our area including, but not limited to, local libraries, museums, historical societies, and the internet. 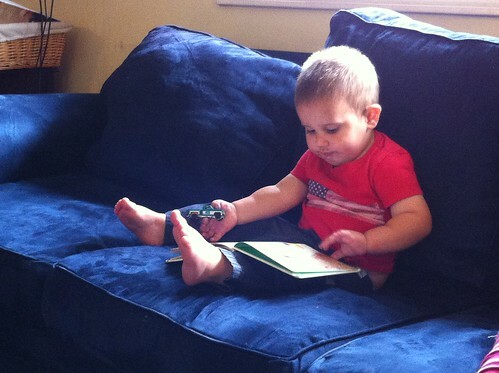 We reserve the right to modify Isabella’s educational plan as her needs dictate. 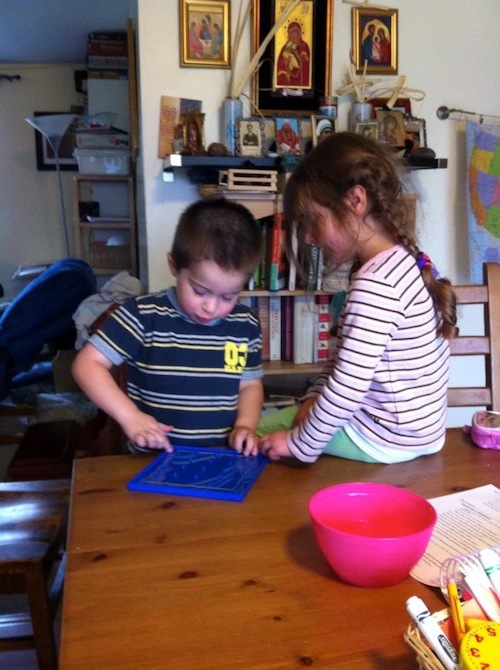 Sophie and Ben play with the math manipulatives after Bella’s lesson. Making silly shapes. [Since we didn’t do any formal math work last year, I didn’t think Bella was quite ready to jump over the K book to Saxon 1, but I also thought the K book might be a little simple for her. As I suspected when I wrote up my plan, Bella is moving rapidly through the K curriculum. In mid-November we are already doing lessons that the textbook has scheduled for February. Some lessons we are skipping altogether, such as identifying shapes and colors and other lessons that are mainly review. For some topics I’m consolidating a couple of lessons into one day’s work. The Saxon book schedules 12 lessons in a month and since we usually have been doing math four or five days a week, we’re well ahead. I know we’ll miss a week or two with the new baby; but I’m hoping to finish the K book early this spring and then move on into the first grade book. As I expected, the hands-on math is really working for us. 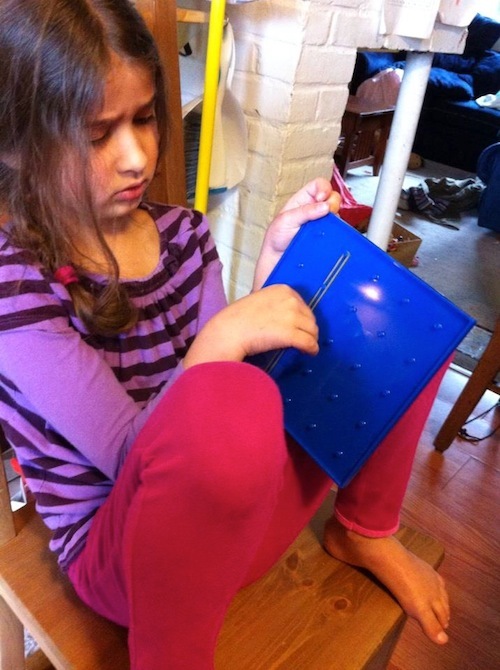 The variety of manipulatives makes math lessons seem like fun and games rather than work. (To me as well as to Bella.) Though there is actually a drawback there because Anthony and Ben usually want to play with whatever Bella is playing with. 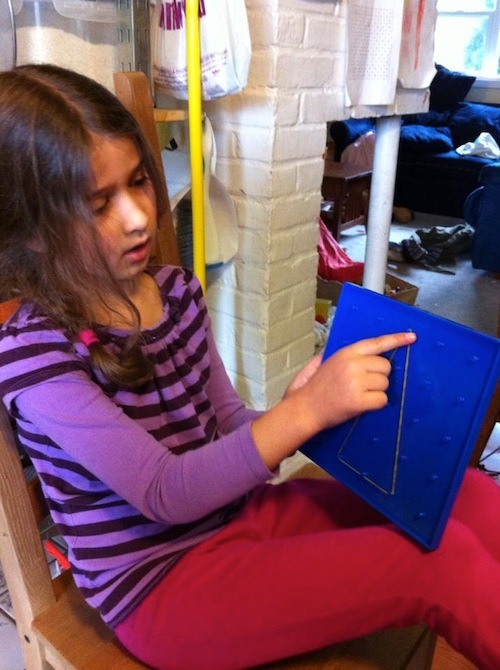 Finding things for them to do during math lessons can be a challenge. This will be supplemented with various books from the reading lists appended to each chapter. Additional special topics as she expresses interest. For example, she’s asked to learn more about insects and fungi. Also, firsthand observations of flora and fauna in our immediate neighborhood and on field trips. Observations will be kept in a nature notebook. I have planned supplemental field trips to the zoo, science museum, arboretum, butterfly exhibit, etc. Bella says that this rubber band represents the Nile River. Later she stretched it into a broad rectangle to represent the Nile in flood.This was supposed to be a math lesson; but I guess it became geography. Will supplement with additional books from the library and online resources as needed. Will supplement with field trips to the Museum of Fine Arts in Boston. Bella says this triangle is the Nile Delta. Lessons with globe and atlas will tie in with history lessons and literature studies. Supplemental work with maps and cultural studies as interest arises. Additionally Isabella has been keeping a geography notebook with a section for each continent that includes a map, pictures of indigenous animals, and will include pictures of people we’ve read about. Currently we are engaged in a unit study on Antarctica. I anticipate that we will move on to study of Australia and then Africa as Isabella’s interests dictate. Others will be added as interest arises. Bella’s handwriting practice. She copied the labels off the cans we’d been using to buy and sell for our math lesson. One thing I’ve noticed is how much more likely she is to find self-directed work to do after we’ve done a little work that I’ve directed. Daily copy work, first working on forming the letters of the alphabet, then, as she develops proficiency, moving on to short passages from our literature selections. Bella with a moth. 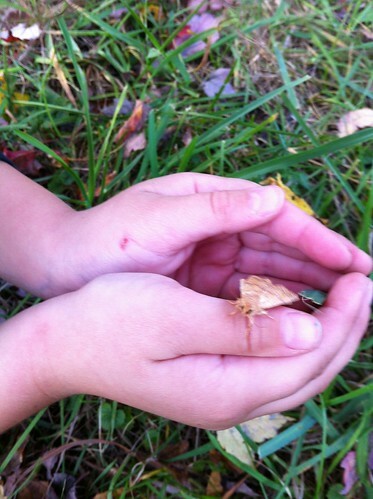 Sophie found this moth that looked just like the yellow maple leaf it was perched on. Of course by the time I got the camera the moth had crawled off the leaf. It didn’t want to hold still for the camera. This was the best shot we could get. 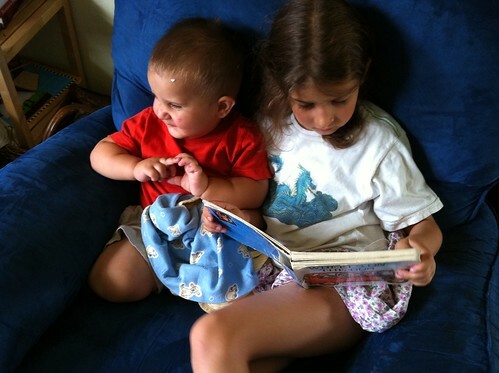 Reading practice with various books at grade level. 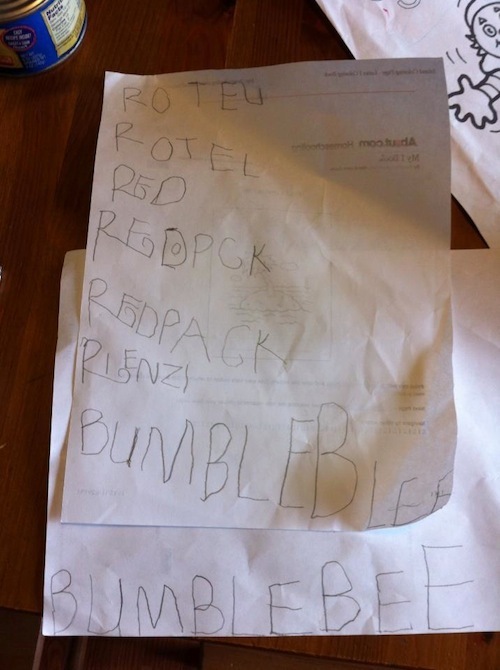 Spelling practice using lists culled from the same books. 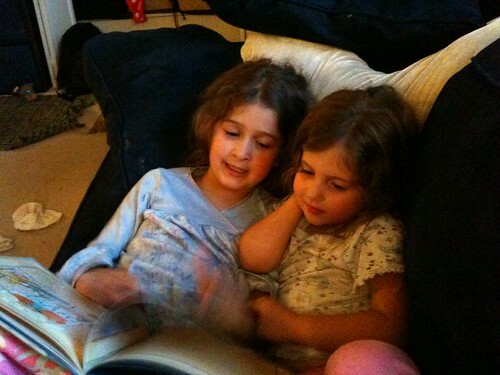 Bella and Sophie reading together. We will choose one composer each six-week term and will read a biography and listen to a selection of compositions. Composers may include: Bach, Beethoven, Mozart, Dvorak, Brahms, Handel, Schubert. We will chose one artist to study each six-week term and will read a biography and will study one picture per week. 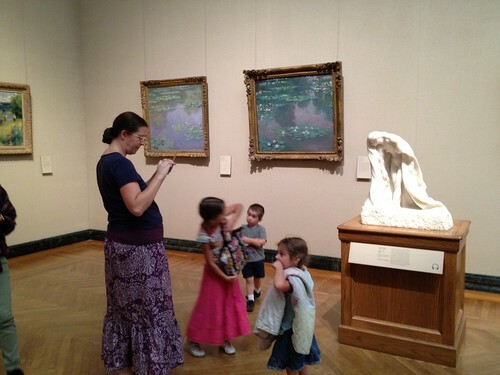 We will supplement with trips to the Museum of Fine Arts in Boston and other local museums. 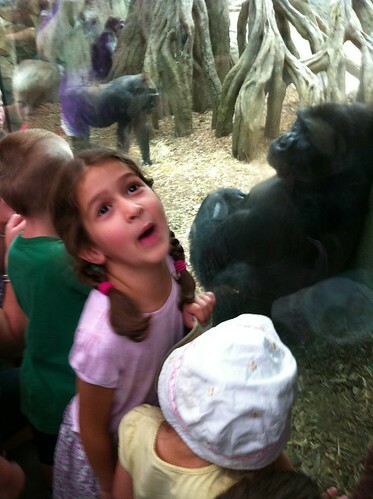 Bella admires the gorillas at the zoo. The baby was wresting with the mother just on the other side of the glass. Art supplies are available for her to use at will. She frequently finds her own projects such as making paper doll families and doll houses. Occasional guided art projects to experiment with various media such as collage, modeling clay.